Hacia el año 1593 Juan de Oñate y su sucesor Juan López de Riego, levantaron un edificio rudimentario para las autoridades. Aquí se demolió y reconstruyó el edificio que a través del tiempo sirvió como una de las Casas Reales, cárcel, parián y Palacio Episcopal para el Obispo Montes de Oca. En 1915 el Ayuntamiento lo recupera y ocupa como Palacio Municipal. Towards the year 1593, Juan de Oñate and his successor Juan López de Riego erected a rudimentary building for the use of the city’s authorities. On this site have been buildings that over time have served as the Royal Treasury, a jail, a market, and the Episcopal Palace for Bishop Montes de Oca. 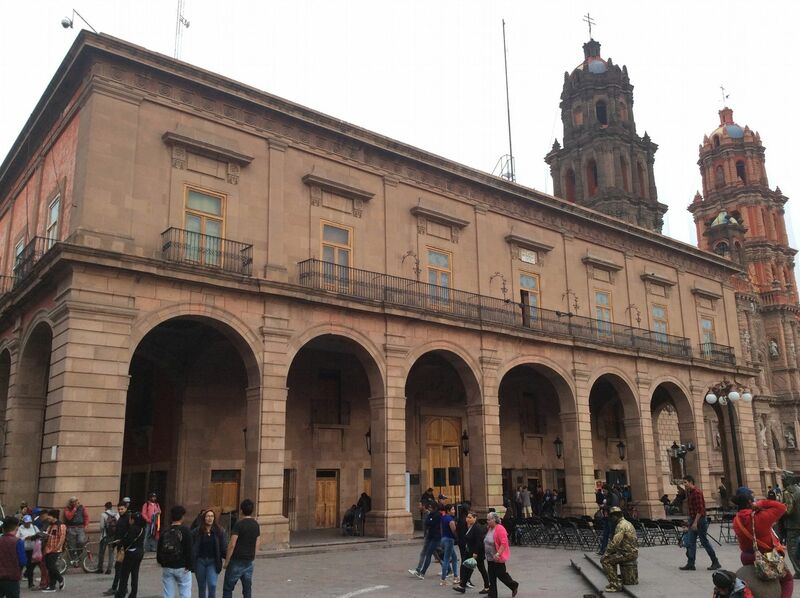 In 1915 the City Council recovered and occupied it as a Municipal Palace (or City Hall). Erected 2002 by Consejo Consultivo del Centro Histórico. The marker can be seen underneath the building's corridor, to the right of the third column from the left. is in San Luis Potosí, San Luis Potosí, in Municipality of San Luis Potosí. Marker is on Jardín Hidalgo just north of Manuel José Othón, on the right when traveling north. Touch for map. Marker is in this post office area: San Luis Potosí 78000, Mexico. Touch for directions. Other nearby markers. At least 8 other markers are within walking distance of this marker. 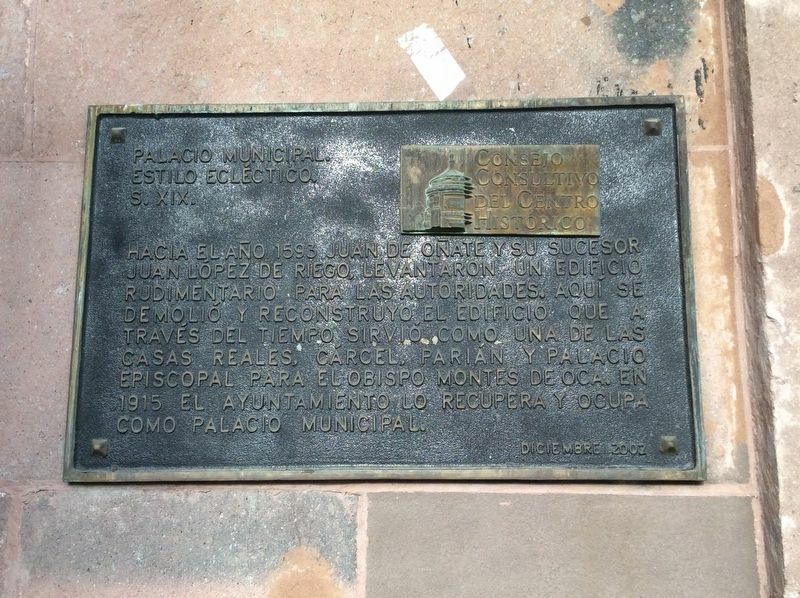 Arms Square / City Hall (within shouting distance of this marker); Former House of the Vicereine (within shouting distance of this marker); The San Luis Potosí Cathedral (within shouting distance of this marker); Metropolitan Cathedral / Vicereine's Balcony (within shouting distance of this marker); The House of the Vicereine (within shouting distance of this marker); Government Palace / Vicereine’s House (within shouting distance of this marker); General Ignacio Zaragoza (within shouting distance of this marker); Pitman House (within shouting distance of this marker). Touch for a list and map of all markers in San Luis Potosí. More. Search the internet for Municipal Palace. Credits. This page was last revised on April 10, 2019. This page originally submitted on April 10, 2019, by J. Makali Bruton of Querétaro, Mexico. This page has been viewed 85 times since then. Photos: 1, 2. submitted on April 10, 2019, by J. Makali Bruton of Querétaro, Mexico.